People who have to work with binary files, analyze and edit binary files, know that it can be a time-consuming and fairly difficult task. Hexinator, a powerful hex editor for Windows and Linux, is here to lend a helping hand. It comes with lots of handy features that will help you save time when analyzing and editing binary files. As mentioned above, Hexinator is available for Windows and Linux. Hexinator for Windows is available for 32- and 64-bit architectures; it is available as an installer and a portable version for 32-bit PCs and as an installer and a portable version for 64-bit PCs. Hexinator is not available for Apple’s Mac OS X yet. That’s why the developer advises Mac users to get Synalyze It! this Mac tool looks much like Hexinator and it offers the same functionality Hexinator does. Furthermore, Synalize It! is fully compatible with Hexinator grammars. The first time you run Hexinator on your Windows PC, you will be greeted by a Welcome to Hexinator prompt. It explains that Hexinator will help you analyze binary files, that you can use Hexinator for free for as long as you want, and that the advanced features that are marked with a green P can be bought once the trial period expires. You will be greeted by a Welcome to Hexinator prompt every time you launch Hexinator after the first time. This prompt lists the files you recently accessed, lets you select and open files, lets you get started with a new empty file, and lets you set up a new grammar. As mentioned at the start of this article, Hexinator comes with lots of handy features that will you save time when analyzing and editing binary files. Here’s a quick look at these features: powerful hex editor that lets you edit files no matter how large they are; advanced search function; display strings in a binary file; decode common data types; universal parsing engine; grammar editor, lots of grammars are available for download; histogram; text encoding comparison; compute checksums. You’ll have access to all these features only if you get a license and activate your copy. You can test all of Hexinator’s features for a trial period of 7 days. Once this trial period is over, you won’t have access to several advanced features (they’re marked with a green P) but you will be able to keep using Hexinator for as long as you want. Hexinator is a properly good and quite useful hex editor. According to the developer, you’ll get things done in half the time by using it. Hexinator is available for Windows and Linux; there’s no Mac version yet, but there’s a Synalize It! tool that works just like Hexinator. 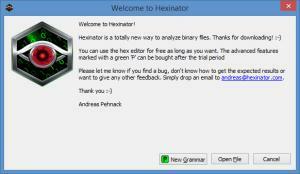 Hexinator for Windows is available as an installer and as a portable version. Hexinator’s interface is just what you would expect from an application of this type. Hexinator is a powerful and feature rich hex editor. Hexinator is available as a free and as a licensed version. Access to advanced features is reserved for the licensed version. You can test these advanced features for a trial period of 7 days. You can download Hexinator free here.